It sounded like a good idea when Gordon (G4DGM) suggested a 10-day tour of the border counties. 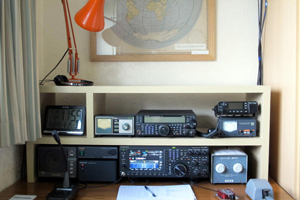 Equipment was available for all bands from 80m to 70cm, with the exception of 4m. 80 watts of RF on all bands, either mobile or portable, with a mast & beams for VHF/UHF plus an end-fed wire & ATU for the HF bands. Early on 1st September I set off by train to meet Gordon at Glasgow station. Gordon's car was bristling with aerials and confident that nothing would go wrong. It was then that he told me about the slipping clutch. Nothing serious you understand. Why, there was almost a quarter turn of adjustment left. Gordon was sure it would be OK. Personally I decided to wait & see. As we zoomed up the motorway at S9+10dB and the flies started to spatter across the windscreen we discovered that the windscreen washers didn't work. Not bad for a car that had been professionally serviced a few days before. Nevertheless, after one stop to clean the windscreen manually, and another to eyeball Jim (G4EIB) holidaying in New Galloway, we reached Gatehouse of Fleet, in Kirkudbightshire by mid-day. 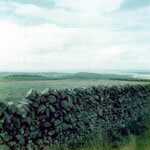 Gordon had already contacted a local farmer and negotiated the use of a hilltop field. The photo (left) shows all the aerials erected. Amazingly enough they all fit inside the car when dismantled. The site had an excellent take-off to the southeast, as can be seen in photo (right). We spent 3 days there and apart from a couple of iffy coax connectors everything went really well. Plenty of contacts back to the midlands. On 40m I was able to give the WAB types a bit of a thrill, and we found a trio of other Amateurs on holiday just a few miles from us. After 3 days of perfect weather, lodgings, and wireless, Murphy caught up with us and the 2m linear went not-so-linear. 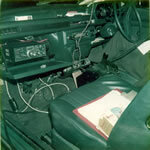 The two photographs (left) show internal views of the car. One with the glove-box open, showing the HF rig, and the other with it closed showing all the vhf/uhf gear. Note the strategically placed piece of wood wedged underneath the transceiver to stop it rattling around too much. 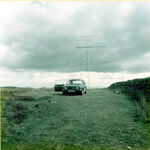 The next site was near Sanquhar, on top of Green Lowther Hill, near the Civil Aviation Authority (CAA) post at 2500ft. asl (and they call it a HILL!). If you obtain prior permission from the CAA they don't mind you being up there because with their 2 MEGAwatts on 520MHz a measly 80w on 70cm doesn't get noticed. We turned off the main road towards the old lead mining town of Wanlockhead. Once there, we turned onto the private track that leads to the CAA post. As we did so I couldn't help noticing the vehicle workshop just off the main road. It contained a pair of snowmobiles. Gordon nodded knowlingly. "The weather can get pretty iffy up here" was all he said. That fitted in with the next thing I noticed. At regular intervals longside the track were snow-poles. Used to locate the track when the snow got deep. They were 8ft tall. 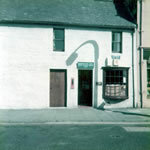 The town of Sanquhar boats the oldest Post Office in the British Isles (left), which was established in 1763. 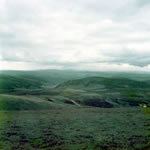 On the right is a photograph taken from the top of Green Lowther Hill, looking towards the lead mining village of Wanlockhead. No mining is done these days, but there is a museum of lead mining history in the area which is worth a visit. The top of Green Lowther is a double-humped affair. One of the 'humps' is occupied by the CAA radome, and the other by a BT tower. We pulled up outside the radome & announced ourselves to the CAA guys. They checked our letter of authorisation & suggested we set up in the dip between the two humps as this would keep us out of the worst of their RF, and shield us from the worst of the weather. Apparently we were lucky. The site averaged around 3 days clear weather each year. Looking outside at the hot sunny day, with a gentle breeze it was hard to believe, but they assured us that 'serious' DXpeditions tents had been (literally) blown off the top of the hill before now. We left them to their work & set up the mast & aerials in the dip. Everything checked out OK, and the short buzz from the 70cm RX at regular intervals reminded us how much RF the CAA boys were sweeping around the hill. Once the gear was set up we decided to wander over to the BT site to show them our letter of authorisation. We stared in disbelief at the huge tower they had. 20ft square at the base, and about half that at the top. All it was supporting were a couple of verticals. We could understand why they needed a tower at this height, so they could 'see' over the other hump of the hill, but Gordon & myself were structural engineers and the tower seemed excessively over-the-top in size. After he'd checked our authorisation we remarked on the size of the lattice tower & were told that it wasn't that size for future expansion, it was only required for the base verticals. Then he told us that the previous one, only slightly smaller, had been blown away in a particularly bad storm. The steel sections had sheared off. The whole tower went about 100 yards horizontally, until it remembered it was subject to the laws of gravity, whereupon it dropped several hundred feet down. For the whole of the first day the weather was glorious. The night was so warm that we were invaded by crane flies (harry-long-legs). One of these intrepid creatures was so fascinated by the courtesy light that he managed to get through the gap by the slide switch and into the roof lining where he buzzed around for hours. Strangely, given the location, nothing could be heard on 70cms and we got the impression that the transverter had gone deaf. By the next morning the visibility on top of the 'hill' had returned to normal; ie virtually zero. With the cloud base at 1000ft, 2500ft is not really the place to be, but the wind wasn't too bad so we decided to go for it. To give you an idea how bad the visibility was, at the top of the hill, the track goes into the CAA compound & then swings left towards the 'dip' and the BT tower at the other end of the hill. As the track enters the CAA compound there is a gate. Despite me leaning out of the window the visibility was so bad that I couldn't see the gatepost as we went through the gate. We unwittingly crossed the CAA compound and only just spotted the edge of the radome a few feet from the bonnet. A white radome in thick cloud is not the most obvious thing in the world. Eventually we found our way to our usual spot & set up the gear. Not being able to see the top of a 12ft mast as you swing it vertical is a strange experience. With the gear fired up it became clear that 70cm was strangely quiet. After confirming that the transverter was totally deaf we retired to the valley for a bite to eat and some surgery to the rig. Maybe that CAA RF had got into places it shouldn't. Fortunately for us, although the transceive outlet of the transverter was dead on receive the auxiliary RX-only port was fine so all we needed was an extra lead to bypass the TX/RX relay board in the 7010 to be back in business. As Gordon had sensibly brought along a full set of tools this did not present that much of a problem. Displaying extraordinary faith in my abilities, Gordon decided that I was going to do the necessary. Picture if you can, the floor of our lodgings with a 7010, MM 70cm transverter, plus MM 100w UHF linear (total cost over £600) and myself armed with a screwdriver & soldering iron. With the covers off the 7010 I lunged at its innards with the iron (I love this bit) and was rewarded with the smell of solder and a pall of flux-smoke. As the acrid smell filled the room Gordon's confidence wavered slightly, judging by the look on his face. Back at the car it actually worked! Gordon started breathing again. After a good meal we set out for the top of Green Lowther Hill again and while Gordon made a few QSOs on 70cm. the wind found its way into the car from all sorts of places, sending my legs numb from the knees down. At this point the weather was so bad we could not even see the aerials on top of the mast, let alone which way they were pointing. My enthusiasm sank with my body temperature and I was very relieved when it was time to go. Gordon backed up the car so we could dismantle the mast & aerials in the headlight beam. The instant he turned them on there was a loud BANG! And it went dark. "Oh dear" said Gordon (ever the master of understatement) "we must have some moisture in the light fittings. Never mind, I've got some spare fuses". BANG! "Dark up here, isn't it". At times like these, the untrained person panics & presses every button in sight, several times. Using this approach we discovered that the headlight main beam circuit was on a different circuit to dipped headlights/sidelights and that this circuit was working. We successfully dismantled the mast & aerials & stowed them in the car. Before setting off I decided to clean the windscreen......and the wiper arm came off in my hand. Using our supply of hookup wire, and some of the most profound epithets I could muster I managed to get it working again. Sort of. After a hair-raising descent of the 2500ft 'hill' in the most appalling weather (and having to remove sleeping sheep from the track), with only main headlight beam working (ever tried that in fog?) we arrived safely back at the digs and I went inside for a change of underwear. Next morning the cause of the light failure was investigated with the benefit of warm sunshine. A steel tow-rope had slithered around in the boot because of all the bouncing around and had shorted out the tail lights. With that dislodged, a new fuse was all it took to get things back to normal. After a hearty breakfast we set off for Dunns. The trip was uneventful except for a couple of attempts to get just that little bit higher. After finding the highest spot on the road, Gordon got out the map & found a forestry track leading to even higher ground. From the comparative safety of the main road I studied the track as it rose at an alarming angle into the swirling mist. Why are all the best VHF sites above cloud? The rain during the night had transformed the track into a lumpy mess which, before going up through the trees, went under a deep pool at the roadside. "No trouble" said Gordon. "If we make it through the pool we're home and dry". It crossed my mind that we were already far from home, and if we didn't make it through the pool we would be anything but dry. Too late. Gordon had started his run, and to be fair he did rather better than I would have believed possible when taking an Austin Allegro into LandRover country. We ploughed through the pool and struggled up the river of mud through the trees for about 100 yards, and he successfully negotiated a right-angle bend between trees on a 1-in-3 incline before the car finally settled onto its sills in some extra-deep mud. Gordon wasn't finished. "Hang on. It doesn't look too bad further on. We just need to get through this muddy patch." 3 attempts later we had gained another 100 yards, but were still in the "muddy patch". The smoke from under the bonnet was accompanied by an all too familiar smell. Antifreeze. "Drat!" The master of understatement had excelled himself. "We must have pulled the bottom hose off in the mud. I hope we can find it." Standing in 2ft deep mud we opened the bonnet for a looksee. Fortunately the hoses were intact. The car had overheated because the electric cooling fan had failed to operate. It had failed to operate because it was thoroughly caked with mud. After about 5 minutes of poking around with a twig we cleared enough of the mud to enable the electric fan to burst into life. While waiting for the fan to cool things down enough for us to be able to put some more water in, even Gordon came to the conclusion that enough was enough. Only trouble was; there wasn't anything like enough room to turn around. We'd have to go back in reverse. Worse still, once we'd started the car moving the brakes were no use because it was just sliding down the mudslide on its sills. With the only control being the use of the front wheels as rudders, Gordon managed to get down unscathed. Even the right-angle bend was negotiated without hitting any trees. I reckon Gordon missed his vocation as a rally driver. As we approached the main road the gradient shallowed to the point where we could actually stop & prepare to rush the pool at the side of the road. Check for headlights in either direction (tricky through trees); lots of revs; and we went for it. Thankfully there was nothing coming along the road and we made it safely onto the tarmac. While I scraped the mud off the windows Gordon got the map out. This was not a good sign. He spotted another forestry track just a mile or so along the road. To cut a long story short, we didn't get up that one either and went back to a lay-by on the road. Murphy was not to be outdone though. While dismantling the aerials later that night one of the element brackets on the 2m yagi broke and we spent the rest of the trip one element short. The next day we moved on to Northumberland and after finding somewhere to stay we set off towards what looked like a super site on the map. It turned out to be right in the middle of an MOD artillery range. Judging by the trackmarks it was a tank training range, and judging by the craters they fired live rounds. Fortunately it was not in use at the time, and it turned out to be one of the best sites we visited. 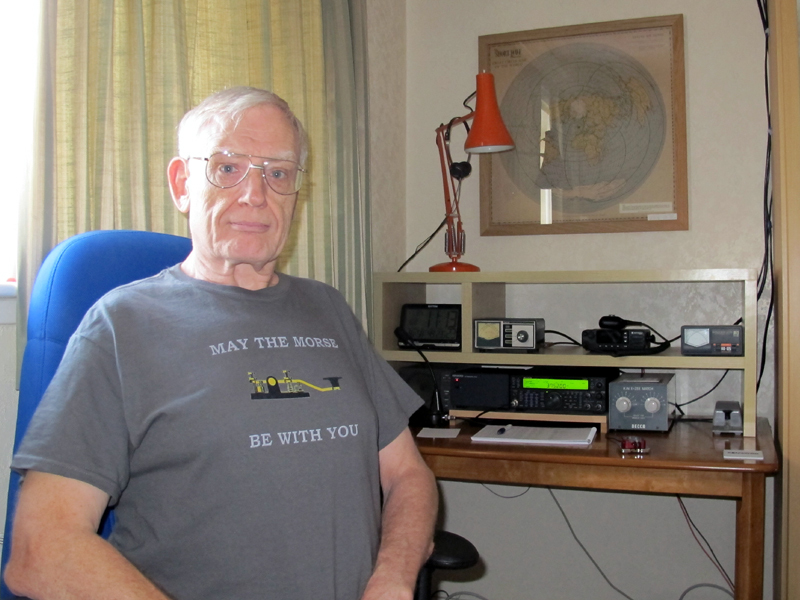 On 40m the WAB square I was giving out caused some raised eyebrows. I was asked to confirm it because "there are no roads anywhere near there". I pointed out that Gordon was not one to be constrained by the absence of tarmac and, spotting a sheep walking past the car said I'd ask one of the locals to confirm our location. I held the mic out of the window and, right on cue, the sheep obliged with a loud "baaaaa". Nobody queried the location after that. Next morning we prepared to leave for Cumbria, with a slight detour via Liverpool. 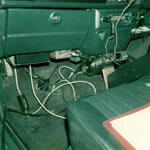 Gordon had telephoned MicroWave Modules who had agreed to fix the transverter while we waited. I guess there have to be some perks if you've bought pretty well every item the company has ever made. There was a slight hiatus when the car failed to start. Out came the tools. After correcting the 50-thou gap on the plugs, and the quarter-thou gap on the points, it took an AA repairman to spot that there was so much dirt/corrosion on the baseplate of the points that they were not earthing properly. It was amazing that the car had ever started at all, even more so that it had been serviced by a garage immediately before the holiday. After a flying visit to the MM factory (where we were treated like visiting royalty) we arrived at Millom where we spent the final two days of our holiday. The only mishap at this location being the loss of one of the element clamps on the 70cm beam. With the holiday over we rolled into the Telford rally at 2pm on our way home. The clutch still slipping, the windscreen wiper sporting an tying wire repair job on the restraining spring, the screen spattered with dead flies, the bodywork covered in baked mud, and a helping of sheep droppings which we never did manage to get out of the carpet.